We take great pride in our quality shopping offer. 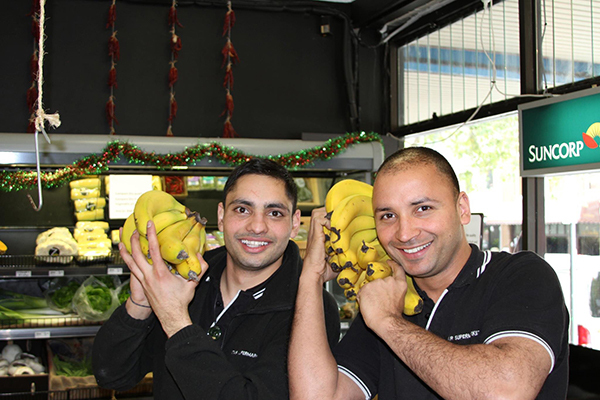 Our fresh fruit and vegetable produce is hand selected by our team straight from the Sydney markets. Our store layout is designed for easy shopping and our range caters for the local neighbourhood and community needs. As a business giving back to our local communities is very important. We support Oz Harvest, Balmain Fun Run, local churches and schools in our different communities. Our range of products in store is specially selected for you with a wide range of everyday, artisan and gourmet items including speciality lines such as organic and gluten free. We look forward to welcoming you in our store and please ask our friendly staff if there is anything you need. The QE Foodstores story started in Sydney in July 2002. I headed to Australia as a 19 year old from New Zealand with a big dream to set up a business with money saved by my family. I didn’t know what type of business or where but I was tenaciously committed to setting up a business for my family. With no work history, limited school education and a history of picking kiwifruit and working on orchards and farms. I soon found rejection was a common theme. No landlord was willing to trust a 19 year old, with no experience. To save money I slept in my car. In Darlinghurst Sydney I got my first break when I found a rundown business for sale. Fortunately, the landlord was Bill Anton himself a young migrant from Greece, who was willing to sign the lease for me. I had first my business. Starting a new business is tough – I worked hard and long 16 hour days , 7 days a week. It was a frustrating time and I remember one Wednesday evening almost 2 years after launch when the street outside was busy and our store was only making enough to keep our head above water. It wasn’t a lack of hard work I realised something else was clearly missing. My brother came over from NZ to help me in 2006 and I had grown to love Sydney so was determined to build a successful business. I have a passion for learning about business and soon learned that to succeed I needed help from a business coach and other key advisors. We worked on our brand marketing and had a goal to create the best small supermarket in Sydney. We called it 7 Star supermarkets. I love fresh food and going to the Sydney markets is something I still do today – it’s my passion to pick the best and freshest produce for our customers. I also love to see our customers delight in the taste, freshness, and price of our fruit and veg. This was a key factor in developing our discriminating offer for our customers. This was the start of our QE Foodstore promise… quality food shopping made easy. Our quality product offer and clear fresh positioning helped our Darlinghurst store grow and we were able to expand and open a second store in Newtown. A new learning experience as we started a new store from scratch with lots of mistakes and insights along the way. For various reasons, we had to change our company name. This was a great opportunity to simplify our promise of Quality Food Shopping Easy. QE Foodstores was created and it steered our company with a very clear purpose and promise. People are a very special part of QE’s success. In the early days, there was just my brother and I. Today we employ 60 staff in the QE team. Our team has built a special culture where we all work hard to deliver a better experience for our customers and supporting each other in doing so. A special focus has been on developing the leadership and management skills within all our team. We have a great team of staff, external consultants and suppliers. QE Foodstores is a proud family owned business. Support from my family has always been great with my mum Jaswinder Kaur pushing me harder than anyone else I know. I never forget the belief they showed in me way back when I started this journey. In 2018 we now offer the QE promise to 9 communities in Sydney … Darlinghurst, Newtown, Camperdown, Bronte, Randwick, Balmain, Waterloo, Oxford St, and Milsons Point. And we are always looking for new communities to serve. We are very proud to have developed and nurtured thousands of loyal customers who continue to choose QE Foodstores and inspire us to do better every day. Quality food shopping made easy is our purpose.